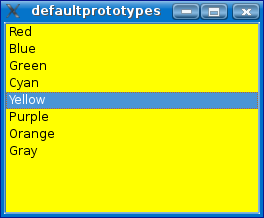 This QtScript example shows how to use default prototypes. With QScriptEngine::setDefaultPrototype() you can specify a QtScript object that defines a scripting interface for any C++ type. In this example, a simple scripting interface for QListWidgetItem is defined, so that the text of items can easily be accessed from script code.